The Degree Programme in Financial Accounting & Management Accounting’s R&D activities represent the interface between state-of-the-art know how and practice-oriented demands of the industry and are based on the most recent scientific findings. In this sense, we strive to extend and intensify existing partnerships with national and international R&D institutions, scientific bodies and companies. Two fundamental principles shape our approach to R&D activities: quality and application-orientation. Our research approach orients towards the needs and special features of the industry by constantly improving the development, flexibility and professionality of our research activities. Our activities are designed in a way that the generated results can be used in teaching. Existing competences in our field of study are bundled into core research areas with the primary aim of focussing our research activities on sustainable increase in corporate efficiency and effectivity. We represent the interface between state-of-the-art know how and practice-oriented demands of the industry. Based on the most recent scientific findings, we develop competent solutions for business issues. Two fundamental principles shape our approach to R&D activities: quality and application-orientation. The focus of this core research area is the development of company-specific and inter-company management accounting solutions as well as finance-specific topics for micro, small and middle-sized companies. These solutions improve the quality of decision-making and therefore contribute to a more successful business leadership. Therefore, it is important to dissolve the conflicting areas between simple application/comprehension and scientific-theoretical principles in an ideal way. For this reason, we also conduct studies on management accounting and finance in practice for SMBs as well as on “best practices”. Focussing on SMBs is of utter importance both on a national and international level. The focus also lies on the requirements and competence profile of SMB management accountants; in particular in accordance with sustainable management. Cost management and design of effective and efficient internal financial accounting complement this core research area. Since today’s conditions on the market have become more challenging and economically difficult and due to an increasing number in business crises, functioning and holistic corporate risk management will be inevitable for successful companies in the future. Targeted confrontation and professional involvement with business crises is of paramount importance for companies from all sectors and sizes. This is, among other things, due to the fact that interest in risk-adjusted information in accounting is increasing significantly and that demands in the risk-orientation of management and management accounting is growing. 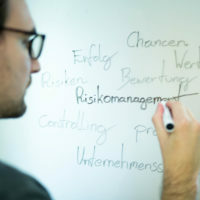 Risk management accounting and reporting, identification and evaluation of risks as well as efficient and effective risk management controlling are the foci of this core research area. Research in this area addresses SMBs in particular and analyses the applicability and implementation of solutions and resulting special features in detail. The dynamics resulting from national accounting and tax regulation amendments and the complexity of these regulations have increased dramatically due to international efforts to standardise national accounting, lay down strict rules in the area of corporate governance and analyse the effects of location competition on the tax policy of separate states. How should Austrian companies and bodies, especially many small and middle-sized companies, cope with the increase in regulatory demands? The core research area in trusteeship aims to discuss issues related to the constant amendments in external financial accounting and tax laws that concern Austrian business locations. In addition, requirements for finance reporting, documentation and disclosure of business data and its costs as well as the effects of law amendments in corporate and tax law on the selection of legal forms, tax planning, internal control or risk management are analysed. Corporate Social Responsibility is a business term that describes the voluntary contribution of the industry to sustainable development that goes beyond compliance with existing legal and regulatory standards. Next to the ecological and economic dimension in sustainable management, there is also a social dimension that demands appropriate management accounting. Sustainability reports document the performance in the social area and are part of a successful communication strategy. The aim of this core R&D area is the conceptual development of practice-oriented sustainability models. The integration of sustainable management in business strategies and operative decisions on sustainability demands sustainability management accounting, which generates data and analyses performance within these three sustainability dimensions. Sustainability reporting then communicates these performances to the stakeholders. We aim to actively contribute to promoting the success of the industry through, for example, application-oriented research and development as well as know how transfer. By working on customised tasks, our cooperation partners are given the opportunity to generate the right solutions for them. The solutions are based on practical, scientific and business administrative findings and the extent of implementation is therefore above average. CAMPUS 02 adapts its research and development activities to the needs of the industry. R&D at CAMPUS 02 is based on problem-oriented solution competence, structured and analytical procedures as well as innovative approaches on a scientific level. CAMPUS 02 is aware of industry demands and creates appropriate practical concepts and problem solutions, thus serving as a contact for entrepreneurs. Find more general information on CAMPUS 02’s R&D services here. R&D in the Degree Programme of Financial Accounting & Management Accounting publishes a number of specialist articles and/or studies every year in order to distribute research findings among the scientific community. More information on our publications can be found here. Austria is ready for Industry 4.0. The role of Industry 4.0 solutions is going to become increasingly important over the years while the digitalisation of the value-creation chain is going to mark business environments. New, intelligent, connected and efficient production methods will take over factories and digital fabricators, namely 3D printers and similar technologies (additive manufacturing, rapid prototyping, fabber, etc.). They have the potential to make the production process radically flexible. Middle-sized businesses are often considered the pillars of the Austrian industry due to their diversity, heterogeneity and flexibility. They are characterised by their innovations and are especially common types of firms in Austria. To continue existing in the long run, it is increasingly necessary for companies with smaller organisational structures to deal with risk-oriented procurement management. By using an effective, holistic and strategy-based procurement management, middle-sized businesses will be successful in the future.